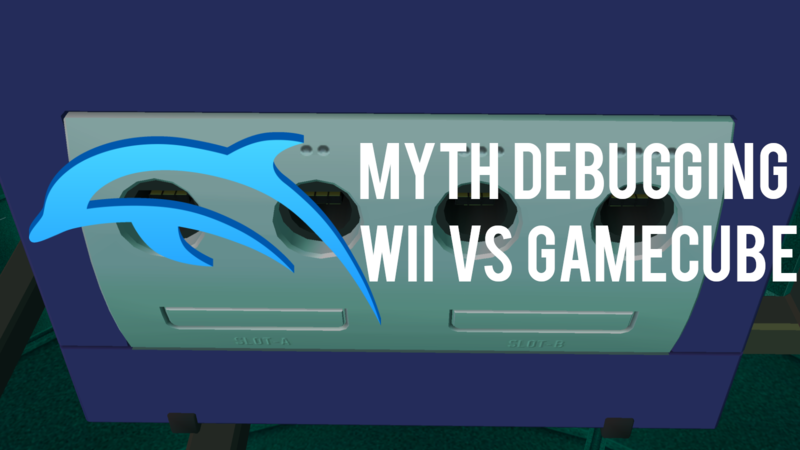 A new article has been posted on the Dolphin blog - Myth Debugging - Is the Wii More Demanding to Emulate than the GameCube? Feel free to discuss this article within this thread. Awesome, a bonus article. You guys are really above and beyond. I always love to read these in-depth articles such as with the Ubershaders, the Qt interface, hybrid XFB, the HLE audio rewrite, the removal of DX9. Quite interesting to know about the differences in the hardware specifications between the GameCube and Wii. Does this mean the article about the unholy trinity of the Disney games is finally coming? I am already hyped! The main body of the Anti-Piracy/Anti-Emulation article is actually done. It's just going through the pain of getting screenshots, pacing the article, and writing a conclusion. IMHO all of this (including the relatively efficient and streamlined development by so many skilled people) makes Dolphin the 'best' (as in most professional project) and most influential emulator there is. I'm pretty sure if there hadn't been Dophin, Citra and Yuzu/Ryujinx wouldn't be as ambitious and fast as they are. BTW, great article, as always! RSIII is so slow in very specific ways so it's not a great benchmark for other games. Totally late on this as I didn't realize that I missed this article just until now, but I believe it was mentioned in another Dolphin-Emu.org article several year back that AMD's HSA and hUMA tech could solve Dolphin's GPU/system memory copying bottlenecks? Now back when that old article was written, AMD obviously only had their woeful A-series APUs available which obviously didn't have the CPU grunt to cut it for Dolphin, but it's many years later and Ryzen APUs are now a thing. The ironic thing is that, now that AMD has an actual competitive APU, I cannot find anything at all on the internet about HSA and/or hUMA and it's support on Ryzen APUs. Having an entirely separate, very non-trivial emulation code path for memory / GPU memory management for one/two sets of CPUs from one vendor is not feasible. I don't think any game engine outside of current gen consoles cared about that. I'm not actually sure any PC games took advantage of it. (08-23-2018, 10:12 AM)Helios Wrote: Having an entirely separate, very non-trivial emulation code path for memory / GPU memory management for one/two sets of CPUs from one vendor is not feasible. Technically there are quite a few mobile ARM CPU manufacturers on board for HSA/hUMA since it was also seen as a benefit to battery life, but again I'm not sure it's really amounted to anything to date outside of AMD processors. It wouldn't surprise me at all if we end up an open AMD-backed standard with minimal uptake, and Intel-developed "standard" that is open but is pretty much developed and controlled by Intel alone, and an Nvidia-developed "standard" that is absolutely proprietary as the Stallman meme goes - and of course, all three implementations will be completely incompatible with one-another. Actually I'm not even sure the PS4/XB1 can even do actual HSA/hUMA as AMD's Jaguar CPU cores pretty much completely predate HSA/hUMA. (08-23-2018, 10:12 AM)Helios Wrote: I'm not actually sure any PC games took advantage of it. That's not exactly a surprise because no developer is going to go out of their way to purchase and then develop for a piece of hardware that performs below par in pretty much all pre-existing workloads (also see: Itanium). That's why I mentioned Ryzen APUs since they're actually competitive performance-wise in those pre-existing workloads vs the Intel competition for a given core/thread count. But again, I can't find anything on the internet about Ryzen APU's HSA/hUMA capabilities - even from AMD themselves!